This interesting name derives from a byname for a friend and come's from the Old French word "ami" with the same meaning. The word ultimately goes back to the Latin "amicus", a variant on "amare", to love. There are numerous other English surnames derived from the same Latin and French roots. 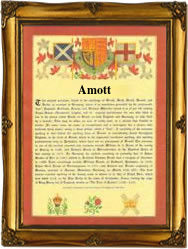 Among the variations most commonly associated with "Amott" are Amiet, Amiot, Amyot. The surname, in one of it's modern forms had clearly emerged by the late 12th Century (see below). Stephen Amyot is mentioned in the Assize Rolls of Kent (1317). The entries in London church registers for the surname Amott appear to be much later than those in Northern English records indicating a Northern centre for this spelling. One, Susannah, daughter of John Amott was christened at Wirksworth, Cromford, Derbyshire on June 25th 1665. The first recorded spelling of the family name is shown to be that of William Amiot, which was dated 1195. Pipe Rolls for Gloucestershire, during the reign of King Richard 1, "Richard the Lionheart", 1189 - 1199. Surnames became necessary when governments introduced personal taxation. In England this was known as Poll Tax. Throughout the centuries, surnames in every country have continued to "develop" often leading to astonishing variants of the original spelling.